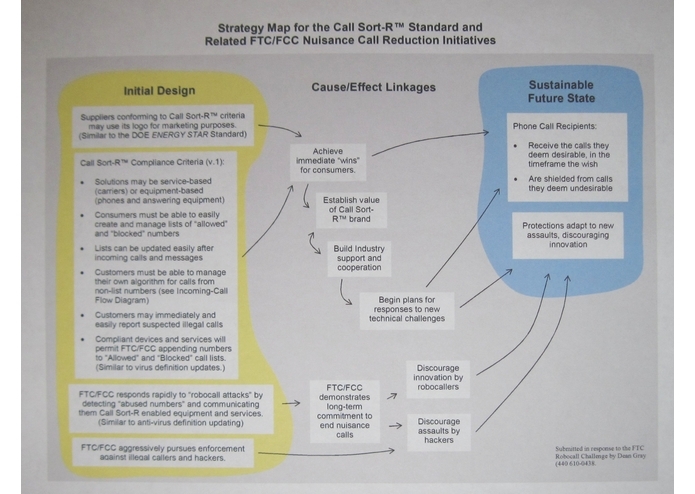 The Call Sort-R™ Telecommunications Standard and Strategy for Eliminating Nuisance Calls. The proposed strategy will create an integrated, continuously-adapting system to eliminate Robocalls and other nuisance calls. It includes the development of an industry standard for compliant equipment and services. The standard will require equipment and services to help detect “abused numbers” and block detected numbers similar to the way virus definitions are detected and updated on individual PCs. Compliant equipment and services will also enable customers to manage “allowed” and “blocked” numbers and to manage an algorithm that governs calls from “non-list” numbers. The system enables adaptive responses by consumers (list management), the FTC/FCC (updates to blocked number “definitions”) and industry stakeholders such as equipment and service suppliers (improvements to the Standard).